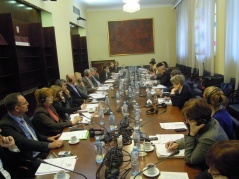 The Committee on Constitutional and Legislative Issues and the OSCE Office for Democratic Institutions and Human Rights (OSCE/ODIHR), with the support of the OSCE Mission to Serbia, organised the sixth workshop on the “Preparation of the Roadmap to regulatory reform of the legislative procedure and quality of legislative drafting in the Republic of Serbia”, on 26 and 27 November 2014. The participants of the workshop are representatives of the authorised submitters of bills - representatives of the Government, ministries, AP Vojvodina Assembly, representatives of the National Assembly, independent state bodies and civil society organisations. Alice Thomas, Chief of OSCE/ODIHR's Legislative Support Unit, said that the purpose of the workshop is to discuss possible solutions and ways to improve the legislative procedure and quality of legislative drafting, as well as present the international standards achieved and best practice examples. In the course of the two-day workshop, the participants discussed three topics: legislative consolidation and harmonisation, monitoring legislative implementation and evaluation, and participation of the public in the legislative process. ODIHR experts Prof. John Bates and Dr Melanie Sully presented the comparative legal experience and the international standards achieved in these spheres, while the situation in Serbia was presented by Assistant Director of the Republic Legislation Secretariat Ranka Vujovic, Chairman of the Committee on Constitutional and Legislative Issues Dr Aleksandar Martinovic and Transparency Serbia Programme Director Nemanja Nenadic. Following the two-day workshop the participants adopted the draft Roadmap to regulatory reform of the legislative procedure and quality of legislative drafting in the Republic of Serbia.